Oct 17, 2017 in "Sunset Seasons Greetings"
Show installation is well underway along Sunset Blvd at Disney's Hollywood Studios as the park prepares for the debut of Sunset Seasons Greetings. One of two video screens is already in place near to Sunset Ranch Market. The other is nearing completion to the right of the Hollywood Tower Hotel. Snow Storm machines line the rooftops, along with ground level mounted units near to Beauty and The Beast. New billboards are also being added - including one that depicts Paradise Pier at Disney California Adventure. Near to Tower of Terror, the new projection platform is nearing completion, with the projector windows now visible on the rear, facing Tower of Terror. In front of the Tower, a number of ground based LED light fixtures are being installed. Finally, some good old fashioned Christmas light strings are draped across the bushes near to the Beauty and the Beast entrance. 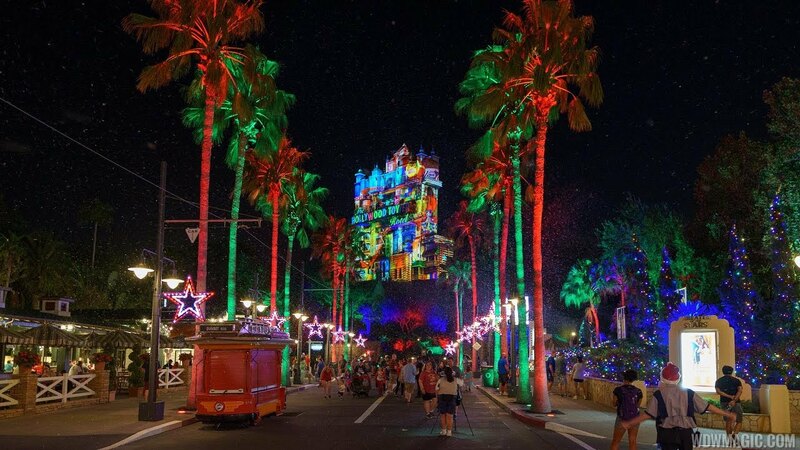 This new projection show will feature iconic characters sharing their love for the season. All the while, the Hollywood Tower Hotel—magically transforms, bringing to life the characters’ stories. The show will run continuously each evening from November 9 to December 31 2017, with performances from 6:30pm to 8pm.